Because of this morning's program I think some of our brothers and sisters are delayed, on genuine grounds. We can understand, but I have no business to make you wait till that long. This morning's program is put up by students of the orphanage, which is started by Bhagavan. They have put up this program. They made the presentation. Around sixty orphans are adopted by Bhagavan and Swami constructed a school for them. They have their own hostel, they have rooms and teachers, medical care, ….tory attention given to them. Just in a record time of two years, the first batch of students appeared for examination on around 6th I believe and I got the marks sheets' zerox copy with me. Five of them got above 80%. One got even 92. This is the nature of Bhagavan; because I was there at that time, while they were selecting children from different villages. They are all orphans, left with a nun, just on the streets and the revenue department people were asked to pick them up, make a list and submit. Thereafter Swami made police people to verify. Further he sent team of teachers to go and visit everybody. So checklist 3, three levels of checks. So, we can understand that they are genuinely poor orphans, left with a nun. From such a category of people, how He made children come out in flying colours, as to secure above 80, one even getting 90 and chant shlokas there and enact a drama in front of us. It's not an ordinary thing, its not ordinary thing. Even rigorous schools find it difficult to make a presentation of that order. Swami's mission is so silent; I am ashamed to say that I have not seen that centre till this day, though I have been here all along. I have not gone there. Swami's spiritual revolution is always silent, without any publicity, without any propaganda. Those of us who are here quite for long also are not aware of things going on somewhere. This is what the divinity is. Man believes in publicity. God believes in simplicity. Man considers propaganda very essential; God feels it as a duty to help his children. Therefore, He does not expect even thanks from anybody. Man wants recognition; God expects transformation. Man expects leadership, but God expects you to follow Him, to follow His example. All His projects, all His programs are going on silently over the last couple of decades. But many many people are inspired all over the world to take up similar programs. In Africa, which is very well known for its poverty, what a tremendous program, Educare program has been taking place, is a matter of revelation quite unbelievable. Children just in rags can't afford even a square meal a day. Such children are brought up in an ideal atmosphere and a very high level of education is extended to them totally free of cost, there in Africa. How people are inspired there, is a matter of a question to a non-devotee but it is a matter of a pleasant surprise to a devotee; because as a devotee one accepts the reality. He never doubts, he never questions. We are participants in this Divine program. We are the living witnesses to what has been going on today, and this is not a small thing. Because when one of these things go into the record, and the future generations go through that record it is a history. But today we see right in front of our eyes what is happening and try to identify ourselves in our own way contribute in our way to the Divine mission. It is a grand opportunity given to every one of us. In fact Bhagavan said, "I can do anything all by Myself. I don't need anybody's support, but for your name, for your fame, for your redemption, for your salvation, I am giving you this opportunity to participate in My Divine mission." Therefore my friends, we enjoy every minute of our stay here. We enjoy every scene that we come across, all that has happened here, in front of Swami. As the devotees we have some times some development or some transformation, which needs us to doubt it. Some people say, "Sir, is this all true? This experience I had, would you please interpret for me. What does it mean?" We doubt our own experiences because of the lack of conviction. One person comes and says; "I feel that I am very soft and calm after coming to Swami. Is it any progress in spirituality? Does it indicate any anything good? I feel very calm and soft. Earlier before coming to Swami I am known for my anger. I am known for my temper. I am known for my vengeance. I am known for all that. But after coming to Swami I am soft and calm. What does it mean?" is a question put by a very sincere devotee. I said, "By being angry, you may be subjected to tensions, worries. It may sometime lead to violence. You will be hurting yourself and hurting others. By remaining calm and quite, leave alone progress in spirituality, at least you are free from that danger of being in anger. If you are in anger there is a threat, there is a danger. If you are calm and soft, you are free from all these tensions and anxieties." What does it mean, a man is calm and soft. This is a feature of a spiritual man. Agitation, disturbance, worried mind, they are in no way qualities of a spiritual man, in no way. A spiritual man always remains calm and soft. You may say anything; he is unruffled. When somebody said, "Baba are You God or fraud'? He said, "I'm god and you are also god." He is not disturbed by that silly question. Furthermore He says," If you call Me a bald man I am not angry with you, because I am not bald. I am not bald. If you say that I have mop of hair on My head then why should I be angry with you. I have lots of hair. I am not disturbed. If you praise me, well, I don't think that I'll be very much elated. No, because you are praising for your satisfaction. You are praising so that you may learn these great qualities. That's what true worship is. Unfortunately worship has come down to the level of a ritual. Finding flowers from the market, buying them, just put it down the picture, that is worship. I am not condemning it, it is a ritual. But something more, true worship is emulation of the Divine qualities. When I say, "O Baba, you are god of mercy", it means I must be merciful. "O Bhagavan you are the one with total compassion", it means I should be compassionate. All the qualities that we attribute to god, all those noble qualities that we sing in praise of god as an act of worship are simply meant to be copied, to be emulated. That is the purpose of worship. But if it is made into a timetable or a schedule, if it's mechanical, well we spoil the very purpose of worship. That is why even the ritualistic people, those that worship regularly, meticulously, are known for their life unchanged. They remain same, because, 5 O'clock meditation, 7 O'clock worship, 9 O'clock bhajans, something like a routine. But life is not routine, life is not mechanical, life is not a schedule. Every moment is the one of excitement. Every moment is a chance for improvement, is an occasion for advancement. We have to find something new in every moment. Nothing should be taken for granted. Just watch what had happened this morning. Did we ever expect that we'll stay this long there? Did we ever expect that there will be program there? Did we ever expect that the program will be a lengthy one? 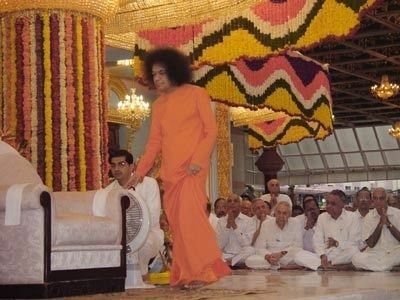 Did we ever expect that Swami would be there around 8.15 or so and the program will go long like this? And those people who think that darshan is between 7.15 and 7.30 what would happen to them when swami comes at 8.20? Who am I to give a timetable to Him? Who am I to indicate His arrival and departure here? Nothing should be taken for granted so far as Bhagavan is concerned. That is spirituality. So to begin with this morning's satsang, the first and foremost point, which I want to draw your attention is this: that a spiritual man is always calm and soft. No Sir I find some people shouting there, are they not spiritual, certainly not. I find some people who are rough and tough. Are they not spiritual? No, by any standards. One has to be quiet, calm and soft. That is the first beginning of spirituality, the first step. There lies the beauty, there lies the beauty. The question is this: how can I be calm and how can I be soft? How to be calm and soft; that is the next question. To answer this question, let me know why am I not calm, why am I not soft? I am not soft because of my indifference. I am not soft because of my selfishness. I am not soft because of my ego. When one fully understands why we are not soft, it may be quite easy to be soft some day or other by making ourselves free from these evil qualities. So a rough, tough, harsh man is egoistic, non spiritual and irreligious. Be that a man of position or authority, whatever it may be. This is a yardstick; he should be calm and soft. Why am I not calm? I am not calm because my mind is not positive. The mind, which is not positive, is never calm. The mind, which is self-centred, is never calm. The mind, which is at extra work, mind which is physical mind, which is worldly is never calm. So I can make my mind calm, remain in calmness, if I am able to turn inward. If I am able to strike a balance between the world and my own religion, I can be calm if I learn how to forgive others. I can be calm if I learn what sympathy is. By being sympathetic towards others we can be calm. By being kind to others we can be calm. By being non-egoistic we can be soft. But not allowing ourselves to playing according to the mind, just judging what is what one can remain soft and calm. The quintessence, one word formula, one word formula to be calm and soft is this, to cultivate Love. A man of Love is always calm and soft. That adds beauty to our life. If I am calm and soft, I should know that I am at the entrance of the temple. I am at the doorstep of god; I am at the doorstep of divinity. This is the first point, which I want to draw your attention to. The second point is this: we start doubting whether this experience is true or not. Often times some of my friends come to me, "Sir this what had happened. How shall I take it? This is what had happened in my dream, how shall I interpret it? This is what Swami said to me. What does it mean?" These are the questions that many of my students and friends ask me. I think it is also your experience; people come and ask, "What does it mean?" My dear friends lets all give a common answer to all such questions. Let us tell everybody, "Never doubt; never doubt your experience, whatever it is." When you doubt your experience please note it is imagination. Any experience doubted is imagination. Simple example. "Swami told me to do it." "How do you know he told you?" "Somehow I felt he was talking to me from within." "Oh I see, very good." Is it true? You have put this question, "Is it true?" "I feel that Swami is giving me this thought, I feel that Swami is giving me this direction, is it true?" My friend tell him immediately, when you put this question, ‘Is it true?' it means it is imagination. Anything that is doubted is either hysteria or imagination. But a true experience, that which is genuine, which is personal, will never be doubted. It gives no scope for any help. We may doubt god but we never doubt Love. Am I not right? You may doubt god but you will never doubt Love. Simple example. ‘My mother loves me', do u doubt that? ‘I love my mother', do you doubt it? He is god, but then I doubt it. That is the reason why Bhagavan always speaks of Love. You don't doubt Love. And that Love is god. God is Love. Live in Love. Never Love is doubted, because this Love is born out of personal fountain of experience. It is born out of your own experience. Therefore you never doubt. Well how to be doubtless? That is the next question. How am I to be doubtless? My friend these are all collected from Sai literature. I am trying to put it as interesting as possible in the form of a question and answer. Because if it is read as a long article, well I think it may not reach your head straight away. Certain books, like Vijaya Sutra Vahini, Jnyana Vahini, Upanishad Vahini, they are very tough. Somehow we have to get them sugar coated and yet see that things get into our head. Like ??. So it is in this direction that I collect these points and am trying to get a place in our head. That's all. Not with the idea that you do not know. No. My friends, I repeat once again, whatever is happening here, not talking about that that you do not know. No. We are sharing all that we know together. We are just exchanging our views on Swami. That is what satsang is. That's all. Satsang is not flow of knowledge from one end that takes place in a classroom; that takes place in a college or a university; where one man sits on a higher pedestal and goes on teaching what he knows to a person who does not know. That is not satsang. This is satsang. Why? Here both of us know, both of us know and we are just reminding ourselves. We are just sharing. We are sharing what all we know together. That is the objective of satsang. That is what satsang in reality is. How to be doubtless, here comes an answer. When the thirst, thirst or hunger for truth is total, when hunger for truth and thirst for truth is total then there will be no doubt at all. Because there is no total hunger, because we are not thirsty in full, we have got doubts. We come here with fixed notions. We come here with a feeling that we can manage ourselves. There is no surrender. With the spirit of surrender, openness, ready to accept, with full thirst and hunger for god whatever experience born out of that state is doubtless. You will never doubt your experience at that moment. Therefore Bhagavan Baba said, "The longing should be so genuine, so deep, just as the calf jumps runs towards the mother cow. The calf watching the mother cow there, goes on jumping running to be very close to the mother, starts licking the neck, because that's love, yearning. So Bhagavan always says that yearning, pining for god should be so deep and total as to give birth to an experience, which will take us to a state of doubtlessness. But when that is not so, all those things that we get are prone to doubt. Point 3, we participate in bhajans we sing, we enjoy, we listen to Bhagavan's talks, we are so happy talking to devotees. We are very much delighted to know the experiences of our friends and relations. But there is one step more required. All that you sing, all that you are happy about, should be continued, because that is not a temporary state of mind. I sing, yes during bhajans I sing ok, but there should be singing within throughout. Bhajans or some time, should be a guideline for bhajan to eternity within. Yes. If there is bhajans going on to eternity within, I can remain calm, soft, peaceful and blissful. But we don't do it. Because bhajan time is between 6 and 7, bhojan time from 8 to 10. …. So when once we feel within, all the external joy, all the external merriment, dance, ecstasy, music, within throughout, that is real spiritual sadhana, that is the real spiritual practice. The real spiritual practice is to chant within continuously, to sing within throughout for which purpose the external schedule is meant. Because somebody came to Swami and said, "Swami we had bhajan for 24 hours'. They thought that Swami will praise them to skies. But Baba said, "What were you doing next, later? You did bhajan for 24 hours, later what did you do? Stop, wait for next year, to do bhajans, 24 hours." It's not so. And Bhagavan also in of the discourses He said, "Akahnda bhajan, akhanda bhajan meaning infinite incessant continuous. But the so-called akahnda bhajans we start at 6 in the evening, conclude in the morning at 6, Bangalore standard time or next day 6 Puttaparthi standard time. Akahnda bhajan. At one of the discourses towards the conclusion of the akhanda bhajan what Baba said is this, "When you start at one time how can you call it akhanda. Akhanda means infinite, continuous. When you start it is khanda, finite, limit, fragmented. So we do khanda bhajan, khanda, fragmented, piece meal, scheduled, time bound and call it akhanda bhajan, infinite. Then the question will arise, ‘Alright shall I do bhajan throughout my life? What shall I do about my living?' It is not that my friend. There is bhajan going on silently within. The silence is more powerful, silence is more powerful than sound. The sound gives a kind of relief of gas from a cylinder, that's all. There is no depth in word; there is no depth in verbal communication. There is fathomless depth in silence. That is the reason why every sage, every saint, every aspirant, every avatar, made the silence compulsory to every follower and every devotee. Silence, Baba said that it is only in the depth of silence that you will hear the voice of god. If you go through the literature of Ramana Maharishi, the sage of Arunachala, arre re what wonderful things he has said. The silence, out of that silence, the Himalayan silence if we calculate in terms of height, or silence as deep as an ocean if you want to calculate it in the form of, in terms of its depth. That infinite silence is more powerful than any word, any expression, any language, any sound. Why? That silence which is within out of which mind is born. Mind is the product of that silence and the mind gives rise to thought. And series of thought interwoven constitute the jagat or the creation. The whole creation, the world is nothing but a bundle of thoughts. And out of these thoughts comes the word or expression. When I say my word or expression is so powerful how shall I take that silence which is the bedrock, which is the very foundation of expression? That's the reason why Ramana Maharishi says, "Silence is more powerful than word. Silence is more powerful than expression, because silence is a language of god. Silence is the speech of god. Silence is the sound of god." This silence within will help us to withdraw our mind, to withdraw our mind slowly and slowly. The sage of Arunachal, Ramana Maharishi speaks more of silence, the depth of silence the significance of silence, the charm of silence, the charisma of silence, the influence of silence, the philosophy of silence. While I don't think anyone has spoken about silence as much as Ramana Maharishi, when time comes we will get into the topic later. So, the point is out of the silence, the bedrock which is the seed, sprouts the mind, out of the mind, the thought and the thought leads to expression or word or verbal or vocal. Therefore that word is least powerful when compared to the silence. Bhagavan wants us to observe silence necessarily everyday for some time. This has been prescribed even to bala vikas children, because silence helps us to examine ourselves, self-examination. But we're busy in examining others. Silence helps us to evaluate myself, but I evaluate others. Silence is a guide to judge myself, but I am busy in judging others. Therefore this sort of silence is necessary just as thermometer is necessary to know the temperature. Silence will show the temperature of owns progress in the spiritual field. There is one great saint by name Ekanath, a great saint from north India. He goes one step forward. If you are to talk, if you are to open your mouth, if you are to express by word, my son, speak about god and spirituality, or else, keep quiet. "You should not speak anything other than god and spirituality, says ekanath. To impress this statement, Ekanath goes one step further. He says all our thoughts is filth, is dust, ugly, and if u r to talk yes talk about god, talk about spiritual sadhana. Most of us who have chosen to live here with the desire to improve ourselves take the lesson of Ekanath. Let us think of Swami, let us think of our own sadhana, let us exchange our experiences, let us encourage each other. That should be only the centre and topic of our thoughts. Nothing else as we understand, because let us know one basic fact. People are mistaken, if they think by coming here that it is be all and end all. Some people say, "I am in Puttaparthi, yes what more I want." I am sorry there are many people in Puttaparthi. Your stay here is not be all and end all. I'm sorry, our stay. Whatever statement I make includes me or begins with me. I'm not different from anybody, least of all of you, least and last of all of you. I have no false claims, as on today. I have no extra authenticity or authority more than anybody else. I am very sure about it. We are fellow pilgrims. We are moving towards together, along the same path of journey towards god that's all. Fellow pilgrims. We are walking along the footpath towards god. That's all. So it is in this context that let us not feel anytime that I am here therefore everything is done. That nothing more is required. No. If you think by being here that this is the goal of life we are mistaken. Why? God is not a goal. Because if you think god is a goal, the road ends there. No. God is not a goal. But god is a journey. He is not a goal. He is a journey. That is the reason why we go on moving, we go on travelling we don't stop. If He is a goal, yes I saw Him yesterday, why should I see Him again today? If He is a goal, I came to Puttaparthi, it is my goal of life. ‘Alright, I can sleep in my room.' It's not a goal. God is a journey and he is not a goal. Love is the beginning. We should begin every journey towards god with love, because Love is the beginning, god is the journey. God is not a goal, but a pilgrimage. God is a pilgrimage but not a goal. Pilgrimage is an activity that takes place throughout our life. Its not seasonal, it is not incidental, it is not accidental. Therefore my friends our being here is an eternal travel and to begin with Love is the requirement. And it is travel: continuous, eternal, infinite because we believe that god is the journey. God is a pilgrimage and that He is not the goal. That's the reason why Bhagavan always says one thing. "Swami, he has been here for last 20 years. Swami, he has been visiting this place for the last several years." That will not make god happy. He says, "Bus conductor comes here everyday. Bus conductor comes here everyday. There are number of shops outside. They have been here for the last several years. Casual labour, carpenters, electricians, masons number of them are here. Do you think they are all liberated souls? Certainly not." So they are here. It is not the physical presence or location, it is an attitude in life. That is an attitude in life, which is the real spiritual pursuit. Then what happens? If your attitude is positive, if my attitude is tuned to god, god will come to you, you don't have to come to god. If Mohammad is not prepared to go to the mountain, the mountain will go to Mohammad, that's what it is. If you are tuned towards god you don't have to go to Him, He comes to you. That's what is happening all over the world today. In 160 countries there are Baba's devotees. In 160 countries there are Sathya Sai centres. They are not all here. Everyone has got his own experience to share. Everyone has got his own excitement to share with his friends. Why? Because though he maybe in New York, but mentally he is here though his body is in Sydney, psychologically he is here. Though he is functioning in his office, continuously singing bhajan made him stay here, enjoy the Divine bliss. So spirituality is an eternal quest, is an eternal quest. We should not put a full stop at any particular stage, because every physical activity has a full stop but spiritual activity is a never-ending process. Furthermore a great philosopher calls it, it is a pathless land. It is an endless journey. We are all on eternal quest, which I wanted to share with you. Alright, if I am to go like that throughout relentlessly, ceaselessly what is happening in the meantime. I go on, go on and on and on as a pilgrim in this pilgrimage of life, in this pilgrimage of divinity. What happens in the process? Simple example. When you sing bhajans full throated, have you examined at that moment what is happening to yourself. When you sing bhajans, full throated, not talking to anybody, not scratching the back. In full awareness when you sing bhajans, have you ever watched what is happening? What happens is this: you as an individual do not exist. You as an individual do not exist. Why do you say that, I am there I am singing. Why do u say I am not in existence? I am sorry. If anybody watches you form a distance as you clap, as you go on singing: if anyone takes a photograph and shows you later Polaroid film, you begin to doubt. "Is it I that did bhajans like that? Was my face like that? Did I clap like that? Did I move like that? Was I ever a dancer? What happened to me? What happened to my head? What happened to me?" Because that ‘I' ness, that ‘me me me' is gone totally, because you melt in bhajans. You merge in god's name; you disappear as an individual. Three things happen. That's why bhajans are very important. That's why I love people who sing bhajans. That's why Baba encourages bhajans. He sits there. What next? Swami's bhajans. C'mon sit. Though the program runs for one hour He still wants bhajans. Because bhajans are the surest, simplest, most guaranteed path to divinity. Yes. Similarly when you put your fingers in the fire they are sure to be burnt. Is there any doubt about it, whether in America or in Russia? No sir, the Russian fire will never burn your fingers. Oh oh, it is not fire. Fire anywhere will have to burn you. Similarly, the fire of god's name, the fire of His glorious …..ous name, the fire of bhajans will make you melt. Melt. Why should I melt? Because my heart is a stone. My heart is a stone. It is not tender and soft like butter. It is indifferent; It is so selfish; it is so arrogant. Such a type of heart first should melt. That's the reason why unknowingly tears start rolling on the cheeks. Just watch. Some people start doing bhajans, but tears start rolling. Just look at him. He will look at you. "Why do you look at me? You do bhajans. Why do you look at me?" "Arre, why are you crying? Is that so? I am sorry." He doesn't know. Tears start rolling on the cheeks without your knowledge. Why? You melt in bhajans. Melt. Like ice that melts, like sugar that gets dissolved. Like that you melt in the process of bhajan. Then merge. You merge in God's name. You merge, because soon after bhajan is over some people don't get up because they are still in the world of bhajans. Those that get up immediately, they have been watching their watch, every time, when to get up. It's very silly. How can you get up immediately after bhajans. Is that possible? Because you are not there. So you melt in bhajans. You merge in the name of god, in the name of god and disappear. Merge, melt, disappear. Melt, merge, disappear - these are the three words, which we should remember. Let the heart melt, let the ego merge, let you disappear. That is the spirit and philosophy and the depth behind true bhajans. Singing of the bhajans, if I come and ask you how my singing is, then better we be away from such fellows. If anyone comments that the second bhajan is not as good as the first bhajan, then he is stupid. Because he is still existing there as an ego. It only means he has not melted. He has not merged, he has not disappeared as an ego. Therefore he goes on grading the standards of bhajans. Whenever I ask some students, "C'mon sing", they feel shy. "Sir, sir not now." I tell him, "This is not music competition. We are not having music competitions. I don't expect from you a top singer. No. The standard of a top singer, no." Bhajan means the spirit, not merely the form. The spirit of the song is bhajan, mere song is music. Mere singing is music; the spirit of singing is bhajan. That's the difference between the two. The singing, the music is just the melody, beat, tune. But the spirit of bhajan, the spirit of singing, the spirit of bhajan is to make you melt, merge and disappear. That's what it is according to Bhagavan Baba. Let us also be aware of what we have right now on hand. Simple example. If we do not know what we have how valuable this opportunity is. If I am not convinced of this, if someone puts a question then my feeling starts wavering, it is worthless. It is useless to be here any longer. Having been here, having been among the path of Bhagavan, we should be so convinced beyond doubt. Simple example. A jeweller knows the value of the diamond, knows the value of the gold. Whereas, an illiterate, a rough thick totally ignorant person does not know the value of the diamond. Plays with it like a stone. But jeweller knows its value. That's the radon why let us adore Bhagavan. Let us sing his glory in full understanding, in full awareness of its value rather than simply making it a mechanical process. And it is in this context; I can also share with you another thought that Bhagavan has given us. Watch your mind. "Watch your mind", said Bhagavan Baba. Statement is understood but is it possible? How to watch my mind? Who is to watch? Who is to watch my mind? That is the dilemma. These are certain things that require in depth study and enquiry. It is not a simple story. It calls for introspection. It calls for meditation and contemplation. It is not simple narration or describe or description of a source. Watch your mind. Some people said, "Swami, how to watch? Should my mind watch my mind?" People say that there are two halves here. This half of the mind should observe this half of the mind or this half of the mind should observe this half of the mind. Who is to watch whom? Watch the mind. Who is to watch? And Bhagavan says, "There is watcher beyond the mind. Watcher. The witness is beyond the mind". That we do not know. Whether there is anything like beyond the mind. Because we think that we are the mind. Everyone identifies with the mind. That is the reason why we are so egoistic. Anyone comes and says, "You are a good man." "Oh I see. Is that so? Has he come to know only now? I have been good all along." If anyone says you are wrong. I am very much disturbed. All this is because of the mind. I think I am the mind. By identifying with the mind, I am not able to go beyond the mind. There is a state beyond the mind. When I go to a state beyond the mind, I can take it for granted that I am along the spiritual path. That's what sage Ramana Maharishi told. Ramana Maharishi always lays emphasis on this. Go beyond the mind. We are not able to go beyond the body. One should go beyond the body, then go beyond the mind; then one can reach the state of witness. The third stage is witness. That watcher is called witness, that's what Baba says. He gives a beautiful definition. Really all of us love Swami because, just as the scientific law in simple terms He gives beautiful definitions to Vedantic doctrines, to philosophical nomenclature. He gives simplest definitions straight. What is meditation? Baba says, "True meditation is to go beyond the mind. To go beyond the mind." So if I say, "In mediation I saw a beautiful swan, in meditation I saw so many colours, in mediation I got directive", that is all imagination. Because you are not there. If you report what had happened; if you go on repeating what had happened it is super imposition. It is the mind that records. It is the mind, which is the computer. It is the mind that reports, records, records, reports. But true meditation is beyond the mind. When one is beyond the mind there is neither recording, nor reporting. So, reaching the witness, the watcher, the more distance between the mind and the watcher, is because of meditation, which is better, all the more good. Wider and wider gap, distance between the mind and the watcher, the witness that; is the purpose of mediation. This morning let me conclude with these three important points for the benefit of those who joined us late. The first point is if one is soft and calm, he is spiritual. Once can be soft and calm if he has Love in him. The contrary behaviour is because of the absence of Love. Point number 2, god is not the goal, but god is the journey. Love is the beginning; god is the pilgrimage. Spirituality is an eternal quest. Point 3. The joy, the bliss that we show externally during bhajan or during meditation or during some activity, during darshan, it should not be time bound. Such dance, that music, that ecstasy should be there within me throughout. The joy, the bliss should be within me throughout. So the external and the internal harmony, synchronicity, synchronicity, harmony; the unity of the external pleasure and internal bliss, the external singing and the internal singing to the beats and the rhythm is the true sign of a spiritual man. Point 4. If my hunger, if my thirst for god is total and full, I don't need to be worried; god will come to me. Without this full thirst and hunger even if I go to god, I am not going to be benefited. If you are not hungry, whether you go to western canteen or the south Indian canteen, or north Indian canteen, it is useless because you are not hungry. If you are hungry, very hungry, wherever you go that hunger will be satiated, that hunger will be appeased. That's what it is. Point 5. Lets watch our mind. Let us go beyond the mind, because the purpose of meditation is to create a distance between the watcher and the mind. Wider the gap, more the distance it is all the better. That is the purpose of meditation. In on sentence, to go beyond the mind is the objective of meditation. With these thoughts I take leave from you for this morning; with a prayer that we will meet once again positively, next week, same day, same time.